The prospect of Bitcoin’s price falling under USD 3,000 sounds scary to many investors, and with good reason: keeping in mind that the all-time high was almost USD 20,000 only slightly more than a year ago and that the price has been almost exclusively falling since then, yet another dip certainly seems like the worst nightmare. But is it truly an apocalyptic scenario or something more mundane? The community is divided on this matter. However, Lingham did not explain his slightly pessimistic view on the price of Bitcoin. Other members of the cryptoverse are theorizing that the Chinese New Year could bring the price down, as that has already happened last year around that time. Back then, Bitcoin fell from USD 11,786 to USD 6,430. The Chinese New Year has often been considered an important factor for change in Bitcoin price, but usually in an upwards trend: from 2015, a trend had been set where Bitcoin loses its value in January and then in February regains it back, but this was broken in 2018 when the bear run continued throughout the year. But with the ban on cryptocurrencies in China, the impact their lunar new year could have on the markets is doubtful. That is also what many in the community believe: “There’s a difference between a market retracement and a date on a calendar. No correlation expected,” says Reddit user u/RossMacdonald. "The market sentiment towards Bitcoin is very neutral and is now approaching a negative range. Bitcoin has a weak social support, which is on a downward trend, and any new price drop could now make Bitcoin enter a negative sentiment range," Pierre-Alexandre Picard, co-founder of Predicoin, a crypto market sentiment data analysis service, told Cryptonews.com. 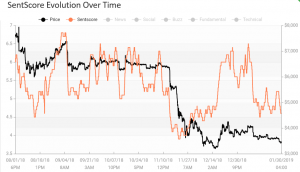 According to Pierre-Alexandre, the recent price drop pushed SentScore below the neutral score of 5, which means that Bitcoin "sentiment support" is getting weaker. Meanwhile, the news about ETFs and other institutionals in crypto haven’t been very good lately. Bakkt, the long awaited futures trading platform developed by Intercontinental Exchange (ICE), has not yet launched due to the government shutdown in the US. Others are also pulling back or at least displaying wariness, as they seem to wait to see how the markets will move before making a decision. The approvement from traditional finance institutions has long been considered a deciding factor in the future of crypto assets. Meanwhile, despite the news that US-based mutual fund giant Fidelity Investments may be aiming for a launch of its highly anticipated crypto custody solution in March this year, bitcoin’s reaction was muted today. But the crypto community is not exactly clinging onto the opinion of traditionalists. Interestingly, a Twitter poll by user @tradingroomapp, that numbered more than 2,700 respondents, shows that 56% of them would actually prefer the price to drop below the support line of USD 3,000 so they can “restock” at a cheaper entry point. And of course, there are those with a different perspective. “If you want to get rich quick then you’re in the wrong place. My outlook is long-term investment,” writes u/getStefano in a Reddit thread.